These interlocking patio tiles are ideal for nearly all hard, flat, outdoor spaces. With their perforated design and drain-through technology, these patio tiles make an excellent pairing with wet areas such as those around pools, showers and hot tubs. Versatile and easy to install, these interlocking patio tiles are a popular product for outdoor use. These patio floor tiles are designed to be versatile and are perfect for outdoor use. Made of a flexible polyvinyl chloride (PVC) material, the tiles do not absorb water. Each tile is equipped with 265 pegs on the underside to secure the elevated tile, while the top surface is comfortable on the feet. Patio outdoor tiles are ideal for nearly all hard, flat, outdoor foot traffic surfaces. The modular patio floor tiles feature a perforated square design which allows water to drain right through them, eliminating the issue of standing water during inclement weather. The elevated tile floor’s drain-through technology allows water to flow out for improved drainage, preventing the growth of mold and mildew. Tops of the tiles remain consistently dry, and these patio tiles are equipped to handle indoor and outdoor areas where moisture is present. Greatmats interlocking patio tiles feature an advanced hook-and-loop connection system to ensure sturdy snap together construction that you can accomplish all by yourself at home with no extra tools. Disassembly is also effortless. This interlocking tile design allows for dry lay installation on any flat surface without need for special adhesives, and 265 pegs on the underside of each tile ensure that the tile stays in place. Border strips are not available for this product. Each interlocking patio tile weighs 1 pound and measures 11.5 x 11.5 inches with a 1/2 inch thickness. These dimensions make for simple planning and installation in spaces of any size and shape. The tiles are also easy to handle and transport, and a single person can perform the installation. While these patio tiles do not have a UV rating, the tiles have been UV treated and come with a 1 year limited warranty. These tiles are not suitable for rubber membrane rooftop surfaces. Please contact customer service at 877-822-6622 for availability quantities of more than 3,000 tiles. Read our product reviews to see how our customers have already used Patio Outdoor Tiles for these purposes. These patio floor tiles are a great choice for a patio, outdoor lounge, or other outdoor entertainment space. Flexible and comfortable, Patio Outdoor Tiles create a great space for guests to congregate. Though the tiles are flexible, they are strong enough to withstand the weight of patio and deck furniture without being damaged. Slip resistance and safety is an important factor in any outdoor area, and these patio floor tiles are an excellent way to prioritize safety in your patio or lounge. With a slip-resistant texture and a water drain-through system, Patio Outdoor Tiles offer a safe surface in all sorts of weather. Because water drains through the tiles, you won’t be left with the hazard of standing water. The tops of the tiles stay dry, meaning you can enjoy the patio again soon after the rain has let up. If you’re looking for a low-maintenance flooring option for your outdoor areas, Patio Outdoor Tiles are the perfect solution. They are UV stable, so they’ll continue to look great even if they’re in direct sunlight. Plus, the tiles are easy to clean – just damp mop them with a common household cleaner. These outdoor patio tiles are an excellent flooring choice for wet areas around showers, pools, and hot tubs. Their slip-resistant texture provides an important safety measure in naturally slick wet areas. Additionally, the 265 pegs adorning the bottom of each tile ensure that the footing stays in place, even when the ground is saturated. Consider using these tiles as your main flooring around your pool or sauna, or adding them to places where you need extra slip-resistance, such as around diving boards or pool slides. These patio tiles are designed with a unique perforated structure which allows water to freely flow through them. The generously-sized perforations are capable of quickly draining away even large amounts of water, such as what would result from splashing in a pool or when someone gets out of a hot tub. The design means that you will never have to deal with dangerous standing water on top of your flooring. Additionally, these tiles are elevated, so water can flow out of them for improved drainage. Such drain-through technology keeps the tops of the tiles consistently dry, while also helping to avoid the growth of mold and mildew because of standing water beneath the tiles. The tiles themselves are non-absorbent, meaning that they provide a durable surface even in wet areas surrounding pools and other water. These versatile interlocking patio tiles create great flooring for basketball and tennis courts, too. The tiles are easy to install and feature a unique interlocking connecting system. Once connected, the tiles are securely locked together, so the flooring won’t shift or separate no matter how intense your basketball game or tennis match gets. Available in three eye-catching colors, these tiles create a professional looking court. The PVC material provides just enough cushioning to be comfortable to stand on, but is not so soft that it would impede your game. With the tiles’ drain-through technology, even the weather won’t keep you down. Water quickly flows through the tiles so that the tops of the tiles dry out quickly, meaning you can get right back to your game instead of having to wait for puddles to dry. Many of our customers have used these interlocking outdoor tiles as flooring for their boat decks. It makes perfect sense, since these tiles allow water to drain right through them and provide a waterproof, slip-resistant surface. These tiles can be cut to fit a wall-to-wall installation, so they’re easy to install in the unusually shaped boat decks. They’ll add an eye-catching yet professional finish to any boat, and are a great way to provide yourself with some extra traction while preserving your boat’s original flooring. Because the tiles are UV stable, you don’t have to worry about exposing them to the intense sun rays while out on the ocean, lake or river. When you’re done with your trip, you can damp mop the tiles with a common household cleaner to keep them looking great. Installing these tiles is easy, thanks to their unique hook and loop connection system. Simply line up the tiles so that the hooks on one tile are aligned over the loops on the other and push down. When installing the tiles in an enclosed area, start in one corner and work your way out. You can cut the tiles with a utility knife for any wall-to-wall installation. These tiles should not be installed on top of a membrane roof, as the underside of the tiles could damage the membrane. 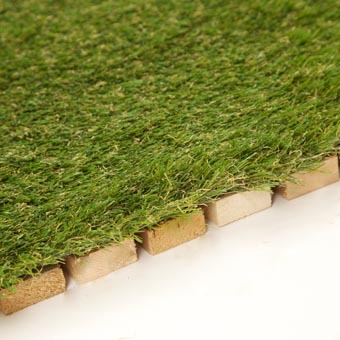 This modular, artificial grass-turf top tile is fantastic for outdoor areas. Great for decks, patios, and rooftop settings. This faux grass tiles turn any outdoor area into a safe and comfortable environment. They can even be used under tables and chairs. Because of their flexibility, these modular tiles can be installed over irregular surfaces and cut to fit irregularly shaped areas. Installation is a breeze for both resurfacing applications and ground level installations. Each tile measures 24″ by 24″ by 1” thick. These patented deck mats are so flexible due to two durable plastic tubes installed through the slats. This enables the mats to lie flat on uneven surfaces. These tiles are an excellent alternative to cold, hard cement balconies and rooftop terraces in apartments and condominiums. Furthermore, they can be used to cover damaged or weathered wood decks. Construction adhesive may be used to fasten the plastic flooring to an existing hard surface or they may be placed loose. They fit similar to a jigsaw puzzle. These tiles are well suited for outdoor balconies and rooftop terraces. Since water can drain through the tiles, there is no danger of water damage to the concrete surfaces of condominium balconies. These tiles will enhance the outdoor living space of any balcony or rooftop terrace. This type of artificial grass tile is an excellent way of improving the look of old and worn out deck surfaces. Installed over existing decking in minutes, the tiles will transform an old discolored wood deck to a thing of beauty. The tiles can also be installed like traditional patio slabs or interlocking stone providing a neat, well-proportioned look. These plastic floor tiles were created to improve the look of balconies, rooftop terraces, outdoor patios and walkways with the warmth of natural wood or the longevity of recycled plastic. This patented, revolutionary new breakthrough in outdoor flooring looks incredible, extends your outdoor seasons and increases the value of your property. Here’s a great flooring solution for residential or industrial wet areas. Our StayLock perforated wet tiles provide a non-slip surface that’s great for decks, patios, rooftops, spa and pool surrounds, locker rooms, and shower areas. 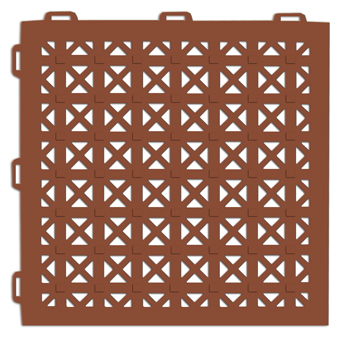 This perforated 1×1 ft modular tile is made of soft plastic material and delivers traction and comfort. StayLock perforated non-slip floor tile easily connects with a tab lock system that will not allow the tiles to work themselves apart over time. This non-slip plastic flooring is available in a variety of appealing colors for indoor and outdoor applications. It is perfect for pool and spa surrounds because its easy on bare feet and durable enough for tables and lawn chairs. The top of this non-slip tile will provide traction when wet and comfort for standing and walking. This modular, non-slip plastic floor tile is also great for industrial applications where workers are exposed to wet floors. This tile will provide an anti fatigue benefit for people standing for long periods of time. This pvc tile is naturally resistant to oils, acids, and toxic chemicals because of the pvc base material. StayLock perforated non slip floor tile easily connects together and does not require adhesive for installation. Easily cut this modular perforated tile with a sharp utility knife for wall-to-wall installations or to install around poles, table legs, or other obstacles on the floor. These modular non-slip flooring tiles can also be separated and taken up easily when needed. The tab attachment system is resilient and designed for multiple installations so you can take the floor with you when it’s time to relocate. This non-slip floor tile can be custom ordered in virtually any color desired.